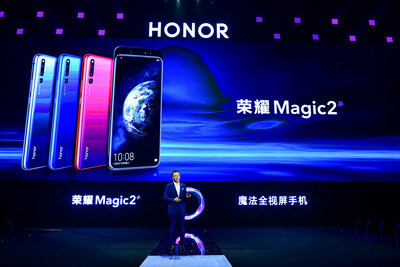 BEIJING, Nov. 1, 2018 /PRNewswire/ -- Honor Magic2, a marvel of engineering infused with Honor's technological expertise, was officially unveiled today in Beijing. 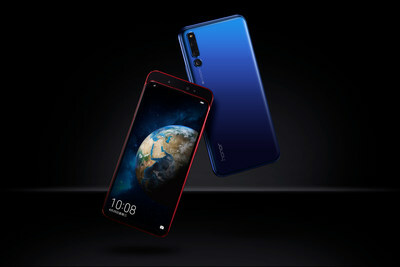 Building on the success of the world's first and real AI-powered smartphone Honor Magic, launched in 2016, the Honor Magic2 is destined to take smartphones to a whole new level due to its vast array of futuristic technology features - the world's first Magic Slide full-view display achieves a nearly 100% screen-to-body ratio; the next-generation AI-dedicated Kirin 980 processor delivers greater intelligence and AI-processing power; YOYO, a powerful virtual assistant, provides an all-in-one smart-living enabler possessed with mind-reading and machine-learning capabilities; and the AI-empowered six-lens camera setup delivers a revolutionary photography experience. As the world's first Magic Slide full-view display smartphone, Honor Magic2 is an "Ultra-simplicity" design model that delivers an unrivalled user experience with a ground-breaking 6.39-inch Magic Slide full-view display feature that achieves a true no-notch. The smartphone has an almost 100% screen-to-body ratio and features optical in-display fingerprint recognition technology. Each slide-down opens the door to a spectacular visual experience. Representing an all-round upgrade on the intelligent front, Honor Magic2 is empowered by the AI-dedicated Kirin 980 processor, which is the world's first dual-core NPU processor. This enables a high-performance AI-computation processing power, providing users with an exceptional AI-driven user experience. Scoring 4,556 points on its AI performance rating, YOYO is the essence of the Honor Magic2 AI system, Magic UI. Equipped with computer vision, natural language processing, machine learning capabilities, as well as decision and recommendation systems, YOYO is an all-in-one smart-living enabler that continues to learn and progress over time. YOYO's capabilities surpass that of an ordinary virtual voice assistant, and can identify, learn, think and improve. YOYO further redefines human-AI interaction to deliver an unparalleled and, scenario-based user experience that makes Honor Magic2 the smartest AI phone available on the market. Incorporated with the 24MP triple-lens rear camera and 17mm ultra-wide angle as well as a retractable 16MP triple-lens front camera, Honor Magic2 offers a revolutionary photography experience. In addition to conducting image segmentation to automatically execute photo retouching by fine-tuning parameters with the ground-breaking AI-powered rear camera, the retractable front camera will also utilize high-level 3D facial recognition and portrait lighting features, creating artistic selfies with excellent beautification and bokeh effects. Honor Magic2 is more than a marvel of engineering technology, it is a futuristic device that undoubtedly puts us ahead of our counterparts. The handset will provide users with an incomparable experience, due to YOYO, the Magic Slide full-view display, Kirin 980 processor, graphene heat spreader technology, 40W Supercharge technology certified by TÃœV Rheinland, 3D bionic light detector, the world's first Dual SIM Dual VoLTE, the world's first dual-frequency GPS, and an unprecedented Wi-Fi download speed of 1.7 Gbps. Equipped with a wide range of state-of-the-art technology and high-performance feature upgrades, Honor Magic2 is bound to be the phone of the year and it will achieve further breakthroughs in the high-end technology market. Its continued advancement also represents significant progress for Honor towards its goal to be among the top three mobile brands globally within 5 years. Honor Magic2 will be available in China pre-order from now to November 5 through Vmall, JD, Tmall, Suning, YHD and GOME, at a recommended retail price starting from RMB 3,799. The official sale in China will start from November 6. At tonight's event, Honor also unveiled the HONOR WATCH, its first flagship smartwatch. Equipped with a 1.2-inch AMOLED round touchscreen and double-sided strap, the HONOR WATCH is one of the slimmest smartwatches on the market. Powered by the industry's first dual chipset architecture, this smartwatch lasts 7 days on a single charge and supports functions such as real-time heart rate monitoring, precise navigation and health tracking. The gadget's global release is planned for January 2019. Honor is a leading smartphone e-brand. In line with its slogan, "For the Brave", the brand was created to meet the needs of digital natives through internet-optimized products that offer superior user experiences, inspire action, foster creativity and empower the young to achieve their dreams. In doing this, Honor has set itself apart by showcasing its own bravery to do things differently and to take the steps needed to usher in the latest technologies and innovations for its customers.